A good employee communications strategy lies at the heart of every successful organisation. 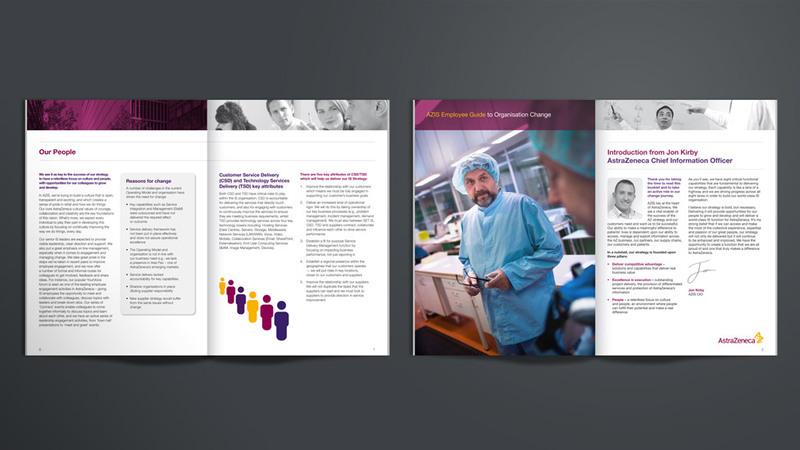 This is something AstraZeneca understand, and have worked closely with Parker Design on for many years to ensure its internal communications materials are engaging, informative and effective. Large multinational organisations such as AstraZeneca are constantly evolving and transforming. When the Information Services (IS) function underwent a period of transformation, we were asked to design a comprehensive suite of employee communication guides, setting out the new strategy. As part of a wider employee communications campaign, we designed the employee communication guide to a handy A5 size, making it easy to handle and not take up too much space on employees’ desks. Working closely within the AstraZeneca brand guidelines, we designed the covers to be bold, friendly and professional, which we achieved through a combination of engaging photography, clean typography and block colour. “Working with Parker Design is a real pleasure. Nothing’s too much trouble and ‘going the extra mile’ is part of the service. They’re pro-active, provide creative solutions, and do whatever’s needed to meet tight deadlines and work within the agreed budget, to produce a quality product. The page layouts are easy to follow, using an uncluttered two-column grid and the text broken up with graphics and photography. The guides were printed onto a crisp white silk stock to ensure maximum clarity and strength of colour. To assist with global dissemination of the message we also created electronic versions of all the employee communications which could be emailed, or hosted on AstraZeneca’s intranet.